London’s award-winning vocalist Sonja Gustafson is a gifted songstress with a unique style and polish. Her traditional approach reflects an appreciation for the forerunners of vocal jazz, bringing a cool verve to classic and lesser-known standards. Honest and soulful in her delivery and grace, Sonja Gustafson is dazzling whether performing passionate ballads, scatting with abandon, or crooning popular covers. And she is no stranger to Wortley Village - she grew up on Ridout St. near Briscoe and attended Wortley Rd. P.S. for 10 years. Sonja is thrilled to be performing in her childhood stomping grounds at the Wortley Blues and Jazz Fest 2017! ​Rob Weatherstone has been playing bass in the London area for many years now. He regularly performs with local groups LP Soul, The Randall Hicks Group, The Young Ones, and Enchante. He works with jazz saxophonist Joe Edmonds, jazz trio Zoot Suite, and fills in with the Accent Trio. Rob is committed to the local theatre scene, playing in pit orchestras for many shows each year. Oliver Whitehead is a busy guitarist and composer. His compositions include works for orchestra, choir and chamber groups, as well as music for TV, radio, theatre and ballet. He has performed at major jazz festivals including Montreal and Detroit. His recordings include a Juno nominated jazz album. He currently performs with many jazz groups and singers in London and is a resident of Wortley Village! Rob Larose works as a professional percussionist and drummer specializing in drum kit, hand drums and latin percussion. 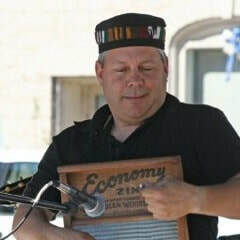 He has been a professional musician and music educator for over 25 years in the London area. A graduate of Western’s Faculty of Music, Rob is in demand as a percussionist and performs with a myriad of groups including Rant Maggie Rant, Antler River Project an The Alfredo Caxaj Latin Ensemble, just to name a few.